One of the most commonly (and arguably trendiest) vilified ingredients in food these days is gluten, a protein that occurs in wheat, barley, rye and oats (except those labeled “gluten-free”). This isn’t news, probably, unless you’ve been living under a rock – or in a wheat field – but I’ve seen gluten blamed for everything from digestive upset to muscle and head aches to … well just about anything you can find wrong with a person. Anecdotally (meaning I haven’t done any formal research on this because I am not a biologist, chemist, epidemiologist, or anything else ending in -ist), the research seems sound: wheat is both highly genetically modified and highly pervasive in the American diet, and too much of anything is bound to leave its mark. I challenge you to find a single processed food that does not include wheat or a derivative thereof. And then there are the predictable wheat products like pasta and bagels (omg be still my heart), which are obviously a huge part of the American diet. The bottom line is that we eat a lot of wheat. And where there is wheat (as well as barley, rye, and most oats), there is gluten. I’m not passing judgement by any means. I mean, don’t get me wrong, I love bagels. Not to mention that nearly everything else on this site is made starting with wheat flour. But for me, at least lately, reducing the amount of wheat, and many other grains, has had a significant positive effect on my health – and I know I am not alone. Whether for health reasons or just to try something new, there is nothing wrong with a few gluten-free treats now and then. 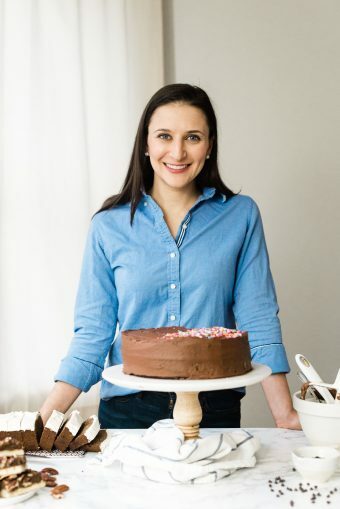 The trick is not to try to make a gluten-free version of something that is heavily reliant on gluten, because that is just gross, but to put the best naturally gluten-free ingredients to work in order to make something delicious. Like these cookies for example, which are made of simple ingredients you already have on hand, and are a big hit among gluten-lovers and gluten-avoiders alike. The secret, if you can call it that, is to focus on the silky moistness that the peanut butter offers, and the intense dark chocolate flavor provided by the cocoa powder. Once you get these flavors and textures right, you’ll never notice the lack of cakeyness or fluff that is missing without the flour. 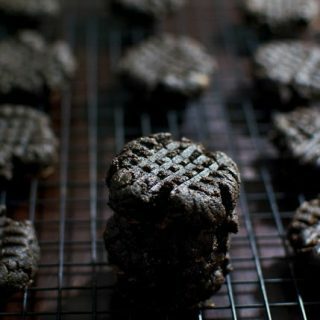 Instead, these cookies are dense, moist, a little crumbly, a little bit bitter and a little sweet. But like any good cookie, gluten-y or gluten-free, the most important flavor is the chocolate. These cookies do not disappoint; in fact the chocolate flavor is so prominent that these couldn’t possibly be called anything less than “midnight chocolate”. 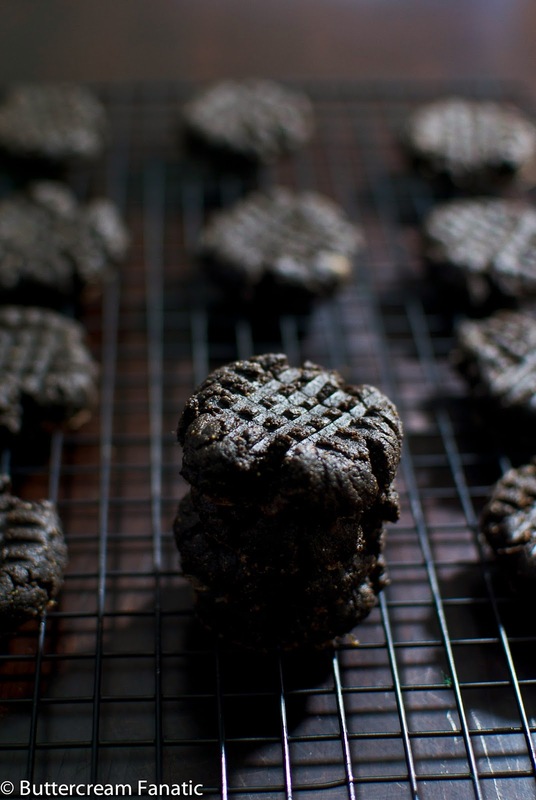 And by the way, if you don’t care about gluten in your diet, don’t overlook these cookies! I served them to many people who all eat – and love – regular cookies without a second thought, and they inhaled them and went back for seconds. So, don’t let the little “gluten-free” label deter you, or risk missing out on a truly great cookie! 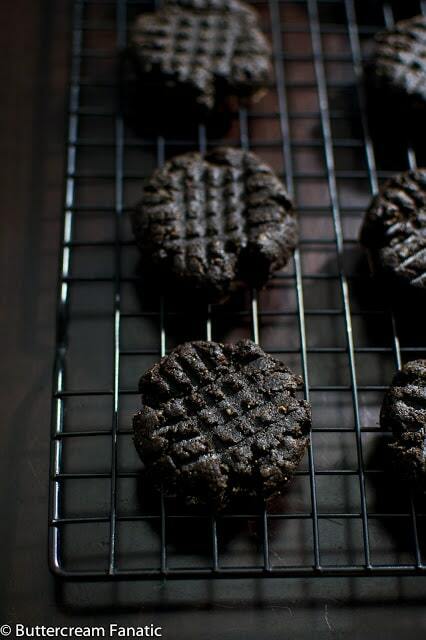 These wholesome chocolate peanut butter cookies and for dark chocolate lovers only! Tons of chocolate in every bite, and a hint of peanut butter too! Beat peanut butter and sugar together on high until smooth. Add vanilla, salt, eggs, and oil and mix to combine. Add cocoa powder, and beat on medium speed until as smooth as possible. It will still be a little clumpy, but that’s ok. Roll into heaping 1 Tablespoon balls, and squeeze gently to make sure the dough is firmly compressed. Place on a cookie sheet 1-2″ apart. Press gently with the bottom of a fork in one direction and then the opposite to flatten slightly and create the crosshatch pattern. Bake for 10 minutes. Cool on the cookie sheet for 10-15 minutes (they will firm up while cooling) before transferring to a wire rack to cool completely. Store in an airtight container at room temperature for up to 5 days, or freeze for up to 3 months.